International Polar Bear Day was founded by Polar Bears International, the world's largest polar bear conservation organization. It is observed annually on February 27. The polar bear is one of the largest terrestrial mammal species. An adult male (boar) weighs around 350–700 kg, while an adult female (sow) is about half that size. The polar bear occupies quite a narrow ecological niche, its lives mainly in the Arctic and is poorly adapted to warm temperatures. The polar bear is classified as a vulnerable species. It means that it is not endangered yet, but it might become endangered due to the circumstances that threaten its survival, such as climate change, pollution, illegal hunting, and so on. The polar bear is an important indicator of ecosystem health: when something is wrong with the arctic ecosystem, it inevitably influences the polar bear population. International Polar Bear Day is a global ecological observance that focuses on raising public awareness about the impact of global warming and the loss of sea ice on polar bear populations. Polar Bears International encourages people to contribute to the slowdown in global warming by reducing the carbon emissions. 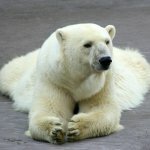 On the occasion, many zoos around the world hold events that focus on educating about polar bear conservation.